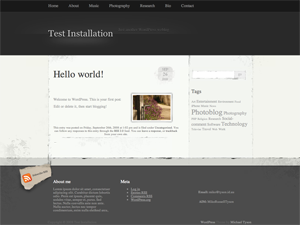 I use your elegant grunge theme and I would preface by saying that it is an excellent theme. Can you pls tell as to how to upload youtube videos using the theme. I have used the simple upload video option as well as a plugin one but the video is not displaying on my theme. Would appreciate if you can help. Hi! I gotta say this theme is beautiful but I can’t seem to figure out how to get my thumbnails back on posts. :o Or is it just not possible? ok, i did. problem is theme version. thx. I wondered if the images are copyright? Can I use the heart shaped Love God in the sand on my church webpage for free if possible please? I’m afraid I have absolutely no idea what you’re talking about, David =) Are you sure you’re commenting on the right website? Looks really neat. Nice to know you come out with such outstanding works. Keep up the good work. Hi Michael, I’m not sure if you’re still checking these, but I thought it was worth a try. First of all, thanks for the great theme – we really love it. I’ve searched high and low for this answer, but somehow it still is alluding me. We just want to display comments on the home page vs the “4 Comments” link. Basically, remove the link and show comments by default. Any thoughts as to how to do this? Thanks so much and I look forward to hearing from you. Is there anything special I have to do to create a child theme of elegant grunge? I am trying to create one, but if I don’t include a copy of /inc/theme-options.php in my child theme directory I get a 500 Internal Server error, and the CSS @import won’t work to include the theme stylesheet within my own. I am trying this both on my live site and my local machine. Previously I had just changed the theme CSS and that worked but I wanted to do it the correct way. Any tips would be a big help! Don’t want to be a bother, but when you try to create a child theme based on this theme, it shows a blank white screen and spits out PHP errors. Could you advise on the proper way to create a child theme? HOW do you add images? if i want to leave comments, how can i post images? is there a way to move the nav bar under the custom header, instead of it being on top? Hi Michael, I really like the Elegant Grunge theme I’m using; however, the forms do not work in IE9. You cannot enter text into comments or search or register fields, for example. So I have to recommend to my users that Chrome or Firefox or Opera, etc. has to be used. Any idea? Hmm, no, no ideas I’m afraid EJ. I think you have the right approach though – ward users off IE, it’s more trouble than it’s worth. This layout looks great! Good job. Any chance of two sidebars for those of us not so good with code :-). We love the Elegant Grunge theme, but we can’t get the subheadings to show in drop-down menu. Is that not part of Elegant Grunge? If not, do you ever plan on adding that to your headings? Thanks for information. I just wanted to stop by and say thank you for this theme – its absolutely perfect for me needs! Is the theme still supported and compatible with the latest version of WordPress, also is it found in the WP.org repository? I just wanted to let you know that the “Elegant Grunge” theme is one of the best designs ever. And I mean of ANYTHING ever! It’s mystically good. Thanks so much. Thanks so much for such a great theme. I have noticedthat the “Top Posts & Pages” widget shows a broken link if there is no image in the body of the post. For example, when the post has a video, or a page has no image, the image returned in the “Top Posts & Pages” widget shows a broken link. Previously it showed the blavatar for the blog when there was no specific image for the post or page–which was great. Just wondered if you could fix it (assuming it’s not a WordPress problem). The problem is a version of the theme. thanks for the tutorial.